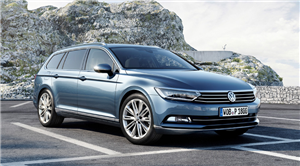 The 2014 Volkswagen Passat has been unveiled – you’re looking at the eighth generation of Passat. The new Passat is based on the Volkswagen group’s clever, adaptable MQB box of tricks, the architecture which underpins the Golf Mk7, too. So it’s cleaner, lighter and bristling with tech. And, yes, it remains the epitome of sensible, stout Teutonic values.